By Srila B.V. Narayana Swami, originally published at Pure Bhakti. The Puranas are filled with innumerable descriptions of the glories of these two kundas. 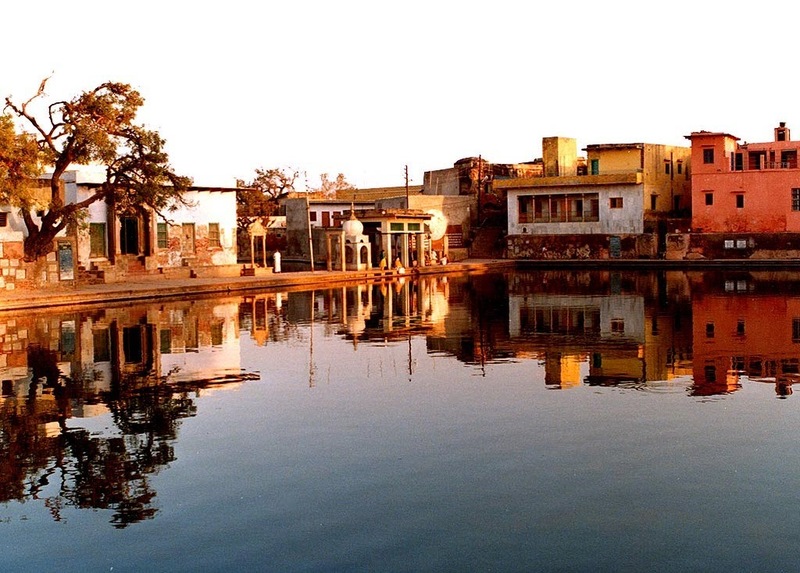 Sri Radha-kunda lies in a village named Arita Gaon, about three miles north-east of Govardhana and fourteen miles from Mathura and Vrindavana. Aristasura was a servant of Kamsa who assumed the form of a bull and attacked Krishna with the aim of killing him. However, Krishna killed him instead at this place. At Sri Radha-kunda, Sri Radha-Krishna Yugala perform their midday lila-vilasa. Here they perform a variety of amorous pastimes freely and without any obstruction. This is not possible anywhere else. Therefore, Radha-kunda is considered to be the topmost place of bhajana, superior even to Nandagram, Varsana, Vrindavana and Govardhana. This most confidential place, surcharged with paramount bhavas, was revealed by Sri Caitanya Mahaprabhu himself, who is endowed with the bhava (sentiment) and kanti (luster) of Sri Radha. Previously, Sri Madhavendra Puri, Sri Lokanatha Goswami and Sri Bhugarbha Goswami also came to Vraja, where they revealed various pastime-places of Krishna; but they did not reveal this confidential place, which was manifested by Sri Gaurasundara himself, who is Sri Radha and Krishna combined. Srimatiji insisted, “Whatever he was, he had assumed the form of a bull when you killed him. Hence, the sin of killing a cow has definitely touched you.” The sakhis supported Her statements. Sri Krishna asked how he could atone for this sin. Smilingly, Srimatiji answered, “The only atonement is to take bath in all the tirthas of the entire Earth planet.” Hearing this, Sri Krishna created an extensive kunda simply by striking his heel on the ground. He then summoned all the tirthas of the entire planet to it. Uncountable tirthas immediately came before Krishna in their personified forms. Krishna asked them to enter the kunda in the form of water. In a moment, the kunda filled with pure, sacred water. Sri Krishna took bath in that kunda and again tried to touch Srimatiji. But Srimati Radhika now wanted to manifest a kunda full of water that was larger and more exquisite than Krishna’s, in response to her priyatama‘s bragging. She and her sakhis therefore stubbornly dug out a very attractive kunda nearby with their bracelets. However, not so much as a drop of water appeared in it. Krishna joked that they could take water from his kunda, but Srimatiji along with her innumerable sakhis prepared themselves to bring water from Manasi Ganga in clay pots. Sri Krishna signaled to the tirthas that they should insist that Srimatiji and her sakhis fill up their kunda by taking water from his kunda. The tirthas personified pleased Srimati Radhika by offering her and the sakhis many prayers. Srimati Radhika then gave them permission to enter her kunda. Immediately, the current of water that had flowed into Krishna-kunda also filled Radha-kunda. With great pleasure, Sri Krishna bathed and performed watersports (jal-vihara) with Srimati Radhika and the sakhis in this dear kunda.